It's my 100th post - hiphiphoray! I am pleased to say to sun finally made a appearance yesterday! The UK weather has been a real disappointment so far this year, but fingers crossed, things may be looking brighter! 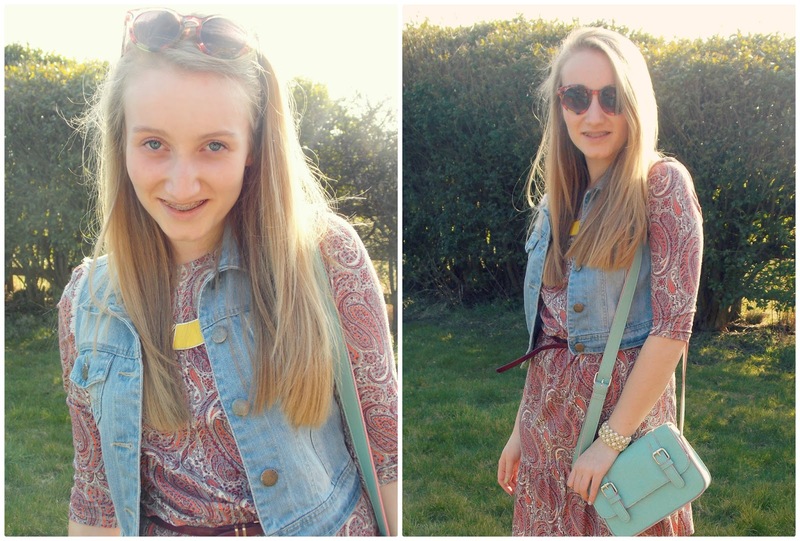 (and now I sound like something off the BBC weather report)... As I couldn't resist the opportunity to finally wear my new sunglasses, I grabbed my camera and a bottle of bubbles for today's outfit post! Today's outfit, is a purchase from one of my recent high street hauls. I was slightly disappointed with the Top Shop sale! So, in desperation, I followed a few sale signs and drifted in and out of endless shops. I found this paisley dress is Warehouse. I wasn't keen on the shape to begin with, but it looked far better on and I fell in love with the pattern...and the price tag of £12 (whoops). 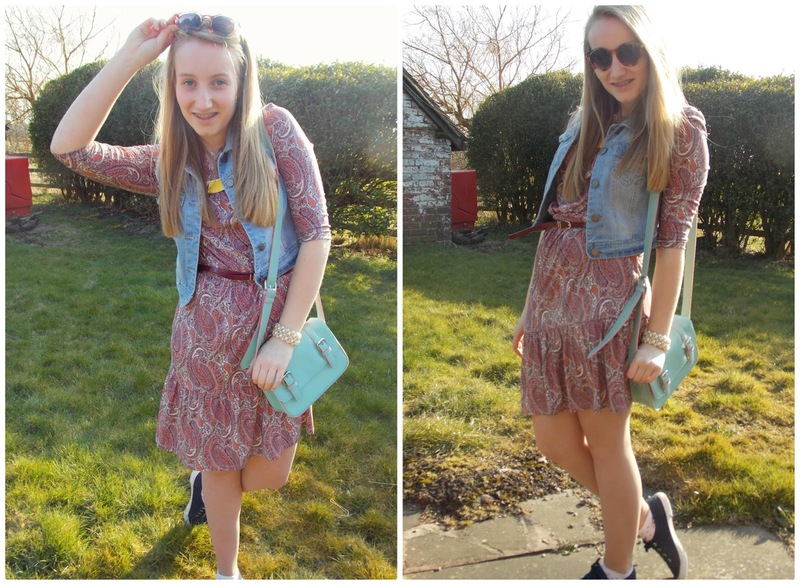 I'm hoping to dress it up for collage and down for sunny days this spring, as it's so pretty! 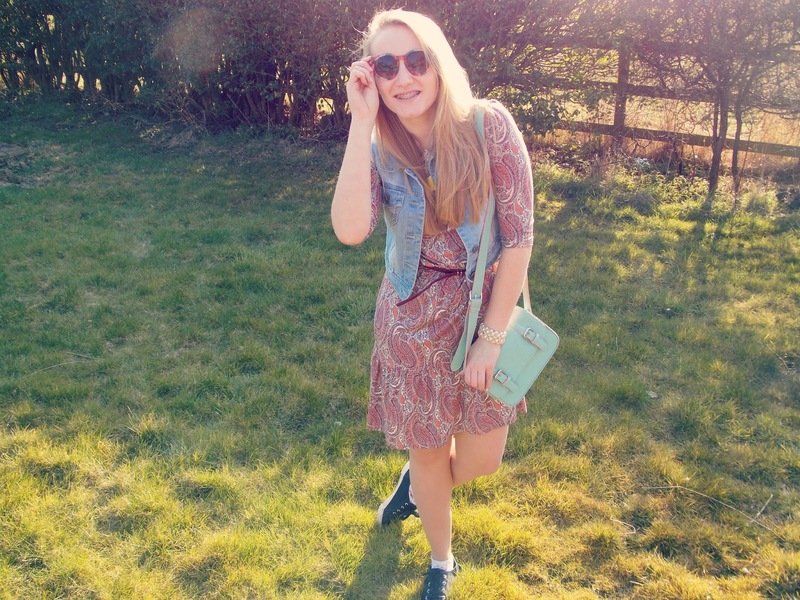 My sun glasses were also a recent steal from Primark. Every girl needs a few pairs of fun glasses for summer and the cheep and cheerful price tag of £1, has got me hooked on them! Problem is my sister now has her eye's on them... oh no! 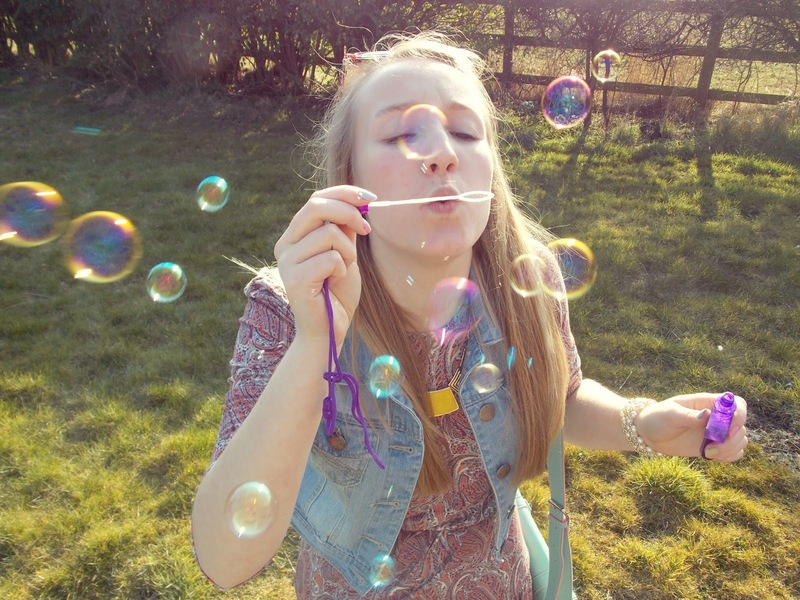 Like I said, this shoot consisted of me mainly blowing bubbles at my camera lens - NOT AS EASY AS IT LOOKS! Not only did my sister face get covered in bubbles (I may post a photo on twitter later - @blondiegrace), but I soon ran out of breath; so it's time I hit the gym! However, it was lots of fun! 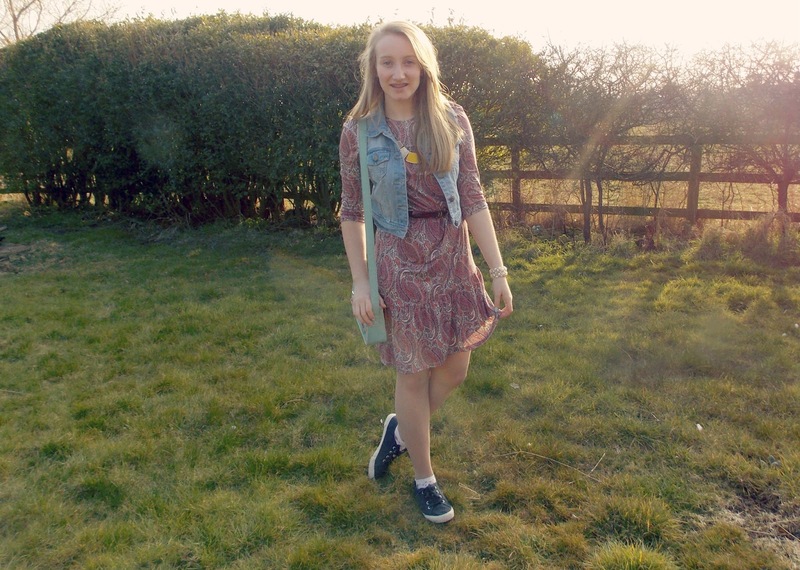 As I see it, I have a year and a half before I got to university to cram in lots of childish fun - though I doubt I will stop there..
What I'm Wearing: Dress £12 - Warehouse, Jacket/Pumps - Primark, Necklace £3 - New Look, Shoes £4- Primark, Belt - H&M, Braclet/Bag/Socks - Charity Shop. Well that's all from me! Anyone else spotted the sun yet in the UK? Let's hope it keeps on shinning! Lovely outfit, it's really cute! I've got a similar demin jacket but ive barely worn it because the weather is so cold! 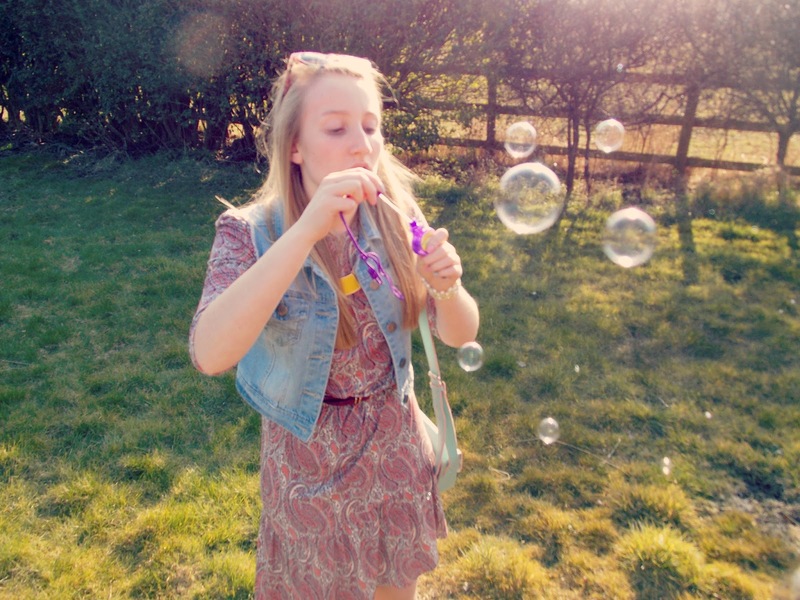 I love the pics with the bubbles, good idea! Grace.. give me your bag. Btw, this is a super cute outfit - love! lovely post and thanx for dropping by my blog! I love your blog! It's great :) Feel free to my blog :)) Maybe, you follow my blog ? ♥ (If you like it) You are amazing! I love the pattern on your dress! so pretty! awh thanks that's so kind! I've already participated in the award scheme in the past :( but it was great fun to do! Your dress is really lovely! and I love your bag!